With over a million copies sold in print, POSB is unlike any other commentary you will encounter. Each volume gives you detailed, verse-by-verse exposition for every Bible passage. Along with the biblical commentary, POSB includes extensive outlines with sub-points, thoughts on practical application, deeper studies on key biblical topics and themes, and full cross references. You will quickly see the added value and ease of use that comes with having this commentary in your Olive Tree library. The Olive Tree edition separates the outlines and commentary to make POSB even easier to use. Instead of scrolling back and forth (or flipping pages), you can see the commentary and outlines side-by-side as you study or prepare your sermon. POSB is also fully functional with the Resource Guide and is configured to help you get to the information you need quickly. You can both drill down to the verse you want to study and easily find all the introductory material on each book of the Bible. The accompanying New Testament Master Subject Index makes it easy to perform a topical study. The Olive Tree edition allows you to use the resource like a Bible dictionary, so you can get to your topic quickly. Each topic links to the POSB commentary text and also includes links to related subjects. 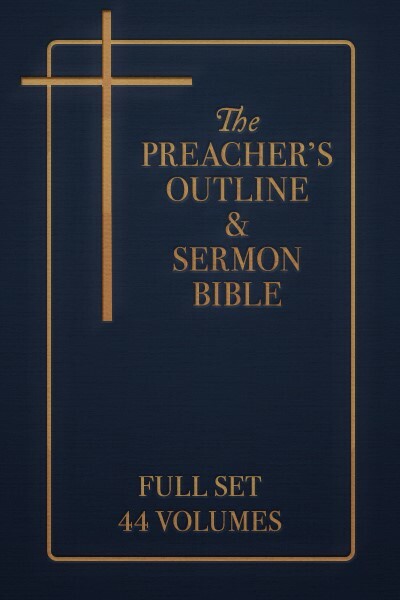 The Preacher’s Outline and Sermon Bible makes it easy to create life-changing sermons and lessons. Everything you need to understand any passage of the Bible is right at your fingertips. And this resource is not just for preachers and teachers; it’s perfect for any Christian who wants to know God’s Word better. This set includes all Old and New Testament volumes, plus a Master Subject Index that contains a topical index of the entire New Testament. These volumes contain the King James Version (KJV) for its Scripture text.